First head on over to the Flot project web site and download the Flot code. Save it to a file called ‘jquery.flot.js’. Then simply add a couple of ‘script’ tags to link the library into your web page. The Flot library has a good set of default for many visual elements. The above is the ‘bare-bones’ graph. Create some data, provide a place holder and create the plot. There are many other options that exist. Flot also allows global configurations to be set by passing a third parameter into the ‘plot’ method. In the above case, the legend is positioned in the top-left (north-west) corner of the chart. The ‘grid’ object above has two flags set to true that enable hover and click events. Your code can bind to these through the ‘plothover’ and ‘plotclick’ events. Both of these bindings provide three arguments to the callback function: event, pos, item. The following is a screenshot of the console log output in firebug for those parameters. 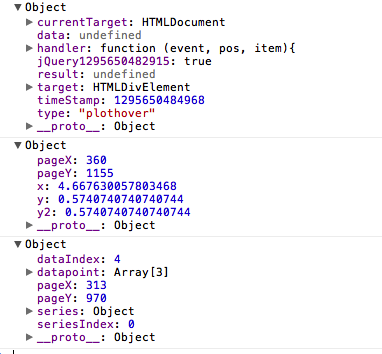 The ‘plothover’ event uses this data to update two div elements (‘#hover’ & ‘#item’). Flot can also be used to plot dynamically changing data. This data could will probably originate on the server and pulled to the client via an AJAX call. 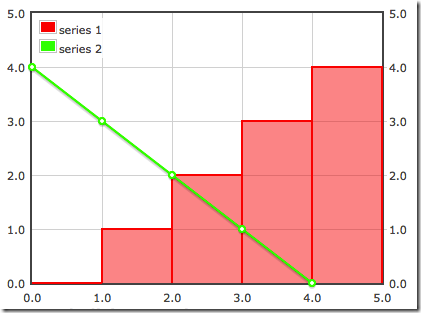 Here is a trivial example demonstrating how to update the chart data. // This could be an ajax call back. The Flot library is very powerful and easy to use. Check out the other examples supplied by the Flot team. Hi how do you put a legend into the dynamic data chart. Hi Bob, I am trying to generate Dynamic data graph with multi aces( one xaxis, two yaxes). I used the sample code of DynamicData code that you here and customized one of the data series so that second data series should bind to yaxis:2 on the right side. But, when I am executing the code it always displaying graph based on yaxis:1, which was default. 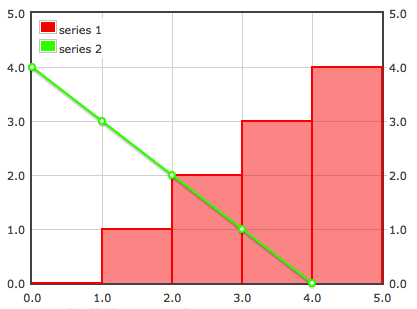 I would like to see second series bound to yaxis:2, please share what changes I need to make. Appreciate your immediate response. Are we loosing the yaxis:2 property by calling any of these 3 methods. Please let me know how shuold I fix this. Really appreciate your response. I would like to know if the Flot could plot data from mysql database? to get my data from a database. You will need to break the problem down into two parts: get the data from the db and provide it to Flot. Sounds like you are having issues with the ‘get the data from the db’ part. Not certain what is going on there, but once you have the data it will need to be provided to Flot in the proper format. Once the data is in the proper format, I see no reason why Flot can’t plot it. thanks a lot it works perfectly, as you said, as you said i first had to get data from the db and then i provide them to Flot. I’m able to get the data from a MySQL database, but I don’t know how to send the data to flot, could you give an example please? Once you have the data from MySQL using (PHP, C#…etc) you then need to render it into your HTML in the format shown in the post. The format accepted by flot is an array of series where each series is an array of points with each point being an array of two numbers. Hope that helps. 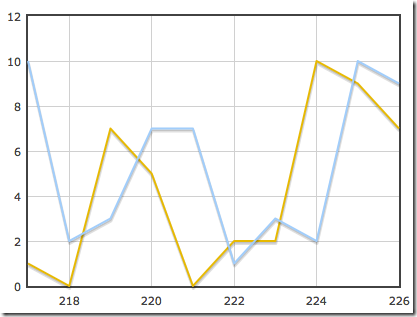 Is there any way to save the chart as image into the server on the fly while displaying it on the web page. I am in need of to export this type of chart and some text in the webpage into PDF/Excel/Powerpoint. So if i store the chart as image on the fly into the server then i can access that image and write it into PDF through some Java code. Is there any way to save the displayed chart as image programatically. Since these charts a generated on the client I don’t know of a way to do what you are asking. 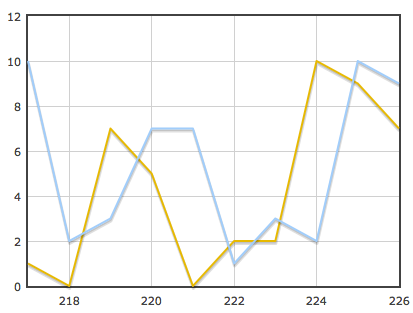 In an application I have at work, I render the charts on the server side. Server side rendering could be modified to save the image. 1. how many tick should be there on x-axis as i don’t have any control over it it depends on a condition when my input = output at that instance of time graph will stop will show that as final result. My requirement is to display other details in hover event. I have all details in my presentation layer, but in tooltip i m not able to access those details. Is it possible to get more details in hovering event than details on the x-axis and Y-axis. I have a requirement where I need to add a series to already existing data in plot for every iteration of for loop. Is there a method to add series to already existing data. 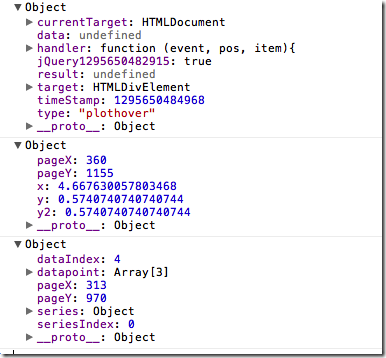 The last example on this post shows one way to inject in dynamic data. In this example, I add the new data to the end of the array (lines 11 and 12) and then force flot to refresh the drawing (lines 19-21). I suspect that you will do something similar. Can we exports the result from jquery chart to pdf? I allrady many libs, however until now I still cann’t export jquery chart to pdf. Since PDF is just a file format, you can always transform the chart into a PDF format. Most likely then the chart will be a bitmap embedded in the PDF. There are PDF libraries that help you do this. A while back I wrote something that emitted PDF files. It is not that hard to do, but nothing that is a part of the Flot library. You could try using one of those ‘print to PDF’ plugins. How do you put the corresponding values on bars in the graph? Nice samples. I noticed that one of the sample highlihts the Bars when hovering over series ‘1’. Can’t you do the same for the line series? Basically I am trying to have a similar highlighting effect on hover for a line chart. It has hover for the bar and the line graph. Click one of the points on the line. You will see the hover over and then a dialog. I want to create flot chart using date(coming from database) as one axis and string (from database),how can I achieve this..please reply back soon..thnk u..
You want to plot a ‘string’? Hi there, great post. I am really struggling to display mySQL table into flot format, know its not really for you to answer but wonder if you could provide a step by step, cant locate this info anywhere on web! So far I have 1 php page that displays a recordset of all my table records. How exactly would I create a chart page to display this data using flot? Sorry for basic question, I have been searching for answer for days now! Each series is an array of arrays with the x,y values in the inner array. You need to query your database and get into this format. Sounds like you already have the query, so a transformation into the appropriate format should do the trick. Do you know of a way to have the plot resize properly while using something like your dynamic data example? When I try resizing (with the flot resize plugin), it works properly, until the plot.draw() function runs in the next interval. Once this function runs, the plot area keeps its new ‘resized’ size, but the data takes on its original size and the axis labels are in the wrong place. Do you know of any way around this? Not sure of the exact solution. I suspect that after a resize event, you can probably refresh the remove the previously generated flot elements and then regenerate with the new size. There may be a better way, but I haven’t looked at the Flot API (http://people.iola.dk/olau/flot/API.txt). Sorry you are having issues. If you post a URL to the page, I can try to take a quick look. how can i export the chart to pdf or png ??? 1. Do a google search for any canvas to png/pdf conversions. 2. If that doesn’t pan out, provide a server side solution that generates the png/pdf and supply a ‘download’ link on the client to fetch it. Hello. I just want to say thanks for the article. It’s very ilustrative specially with the examples and very easy to read and understand too. Thanks for your work, it really helped me. Hi, great tutorial, I want to use data from mysql, but I don’t know how to insert the php variable in the jquery, do you have an example? can you give me an example, thanks you so much. Hi, i have the same question as the other poster. Just want to say thank you. I spent hours trying to do this without success and finally found this on google search. Didn’t know it would be so easy. I have a question can i share this on my blog ? of course with credits. Thank you, I’ve been searching for facts about this subject for ages and yours is the best I’ve found so far. hi Bob, i want to plot more than 1000 array elements coming from the database on the x and y axis og flot. when i plot some limited points the flot only shows them and not the remaining points. it seems that flot only plots the points mentioned inside the data variable defined in the script. Since my data is changing every 1 hour how will i plot these data on flot ?